UK: Fugro is deploying a floating lidar buoy at the proposed site of the 970MW Navitus Bay project, off the UK's south coast. Fugro's Seawatch floating lidar was first deployed in February. It is being used to measure wind speeds, wave heights, and meteorological data at the Eneco and EDF joint project. The device records the wind speed data every ten minutes and wave heights every half an hour. It can monitor wind speeds between 20 metres and 190 metres above sea level, with a focus on wind speeds at the expected turbine hub heights. It will be located at the site for 12 months. A spokesperson for Fugro said there is an option to extend the contract beyond the 12 months if further measurement is needed. 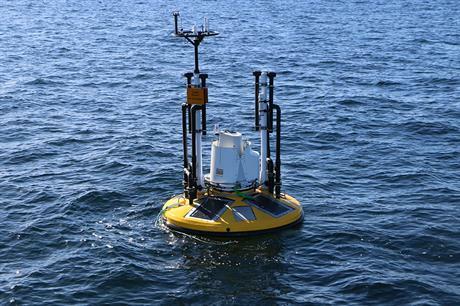 Fugro said the buoy was last used at Eneco's 129MW Luchterduinen project off the Dutch coast. It took the company three weeks to make the lidar ready for its Navitus Bay deployment. In November, the device was validated in line with the Carbon Trust's roadmap for industrialisation of floating lidars. The UK's planning inspectorate is currently considering Navitus Bay. Included in the plans is a turbine mitigation area option, which would see the project size cut to 630MW. A decision by the authority is expected in June, with a final government decision expected by September 2015.